Every now and then, it’s only fair to throw all caution to the wind and dive head first into a super rich and indulgent cake. 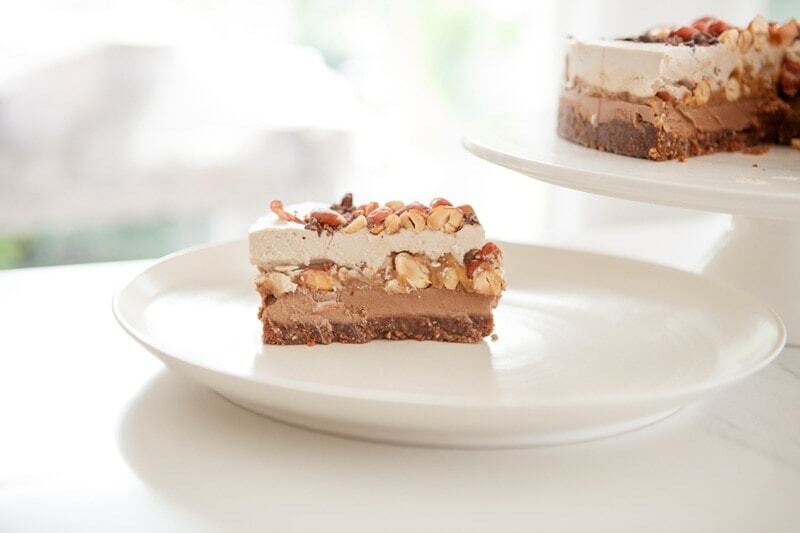 And although this raw Snickers Cake is (as always), entirely plant-based and free from gluten, dairy and eggs, be under no illusion – it is certainly indulgent, and does have a fair amount of sugars – albeit natural (and for the most part, coming from those juicy Medjool dates). That said, you’ve also got just over 7g each of fibre and protein per serve, so I guess that’s something. And, as a final warming – this won’t be a quick recipe to pull together – and nor should it – there are so many different layers and textures in here and that is what makes it so special. Right, now that I’ve got my disclaimers aside – let’s dive into this epic celebration cake! 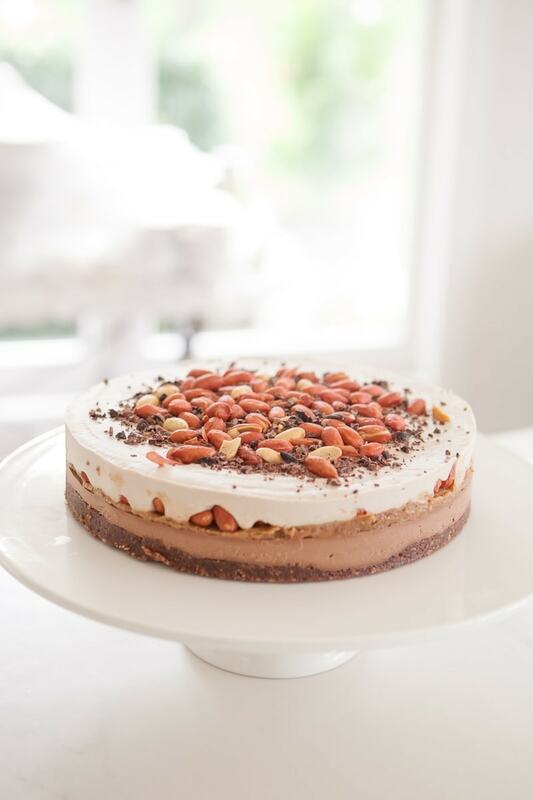 The cake itself is not too dissimilar from the other raw cakes I’ve made here on this website. The magic is in the added extras – the thick caramel, roasted peanuts and wicked chocolate drizzle. Making vegan caramel without sugar and butter is actually easier than you might think. Big, soft, juicy Medjool dates on their own have caramel notes to them, so all you need to do is add in a few complementary flavours to round it out. I used home made almond butter (store bought is also fine – just omit the extra salt), nut milk, lemon juice, and a little brown rice syrup. Believe it or not, the lemon is the critical addition. The chocolate drizzle is the final touch to the masterpiece. A simple combination of pure maple syrup with raw cacao powder, coconut oil, sea salt and vanilla. 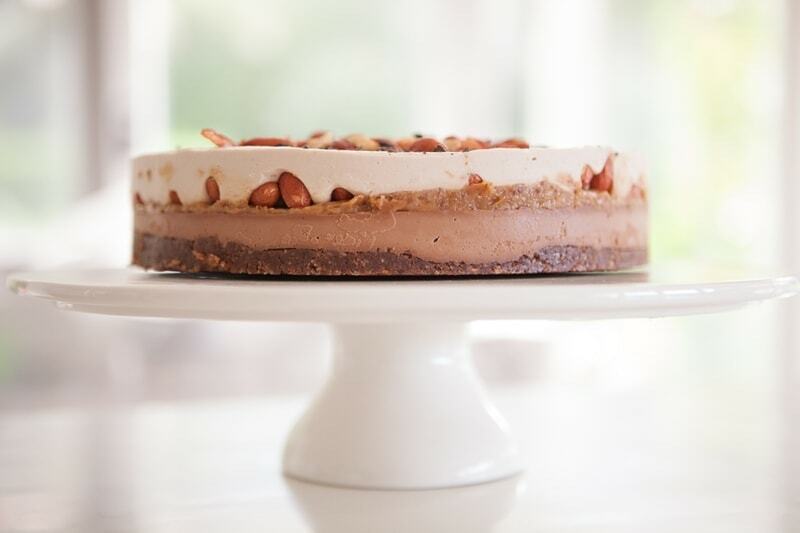 You only need a little amount – but the cake isn’t complete without it! A raw, no-bake Snickers Cake – entirely vegan and gluten free. Total over the top indulgence – but hey – you only live once! 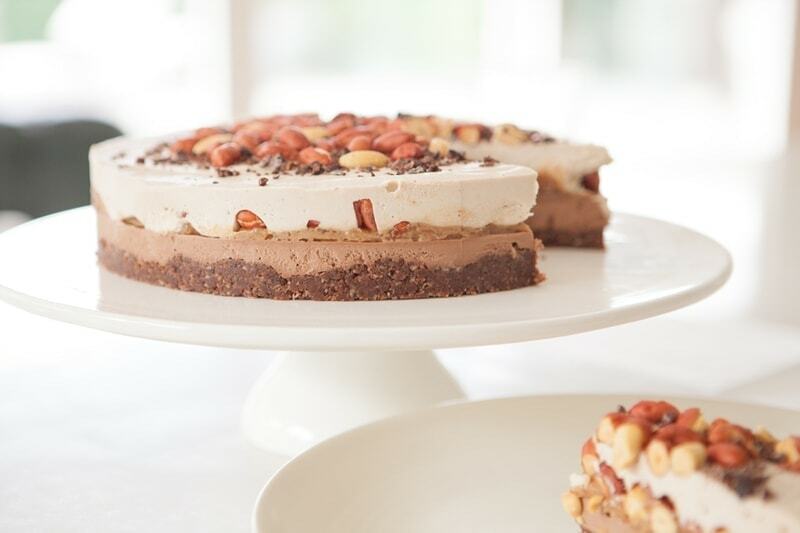 Note: to make the chocolate and nougat layers, you will need to soak 2 cups of raw cashews overnight or for 8 hours. Once drained, they are ready for use. Soaking softens them and gives a super creamy result. Makes a 9 inch cake. In a food processor, blend the walnuts and coconut till fine and crumbly. Add all other ingredients and whiz till it becomes a sticky dough. Line a 9inch spring form cake tin with baking paper. Press the base mixture into the tin and even out the surface. Drain and rinse soaked cashews. Blend everything in a high powered blender till smooth, pour over the base and set in the freezer. 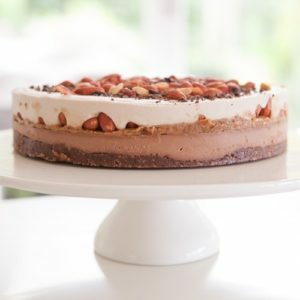 Blend everything in a high powered blender till smooth, it may be quite sticky – that’s ok. Use a spatula to spread the caramel over the frozen chocolate layer. Sprinkle as much of the roasted peanuts over the top. Drain and rinse soaked cashews. Blend everything in a high powered blender till smooth, pour over the chocolate / caramel layers and set in the freezer. Blend everything on high till smooth. 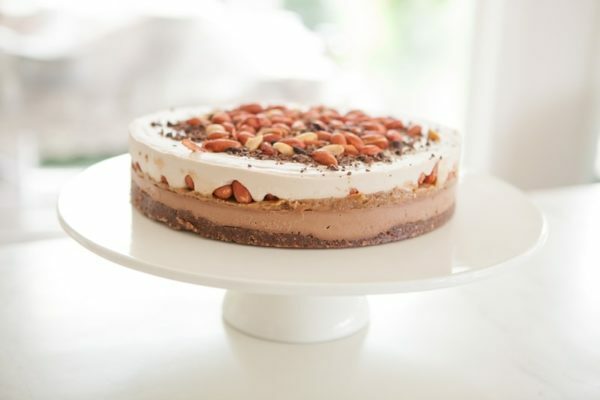 Sprinkle the surface of the set cake with roasted peanuts. Drizzle chocolate sauce over to finish. Best kept in the fridge or freezer. Portion control guys! This is an epic cake.